Lambskin with palladium metal hardware and multicoloured Arena leather stripes, 18.7" x 21.8" x 11.7"
Fashion has a tendency to transform the mundane realities of everyday life into pieces which are somehow desirable. There have been Christopher Nemeth's post sack dresses; the times when Maison Martin Margiela turned cutlery into jewellery; Jil Sander's infamous paper bag and Anya Hindmarch's metallic moulded crisp packet, not to mention Dolce & Gabbana's recent adaptation of spa slippers into terrycloth sliders, or John Galliano's Margiela marigolds. 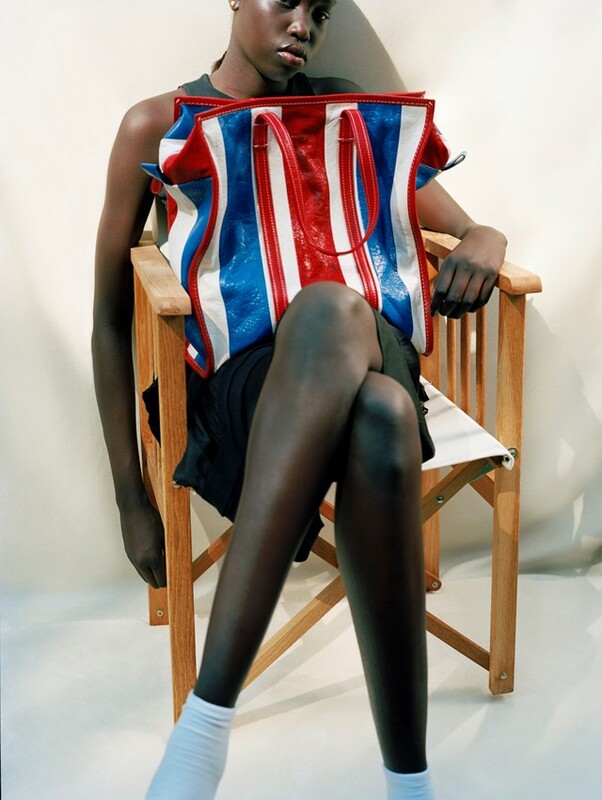 Now, Demna Gvasalia's Balenciaga Bazar shopper has turned the signature stripes of Thai laundries, and the sort of shape and fabrication distinctly familiar to those carting their dirty clothes to a laundrette, into aspirational luxury. Usually formed from slightly frayed nylon and found ten for a pound on market stalls, this version comes in lambskin, complete with palladium metal hardware and a gold-stamped house logo. But why does fashion maintain such a fascination with the banal? Perhaps it is a sort of postmodern commentary on capitalism, on the power of branding and consumer mania – after all, Gvasalia is the man behind Juicy Couture appearing at couture fashion week, and the phenomenon of the £800 Vetements hoodie. At Balenciaga, he has taken eveningwear inspiration from Paris' bargain basements and turned nylon windbreakers into sculptural masterpieces. His is upcycling at its very best – and, whether it speaks to a loftier philosophy or not, it is the perfect example of elevating the prosaic into the aspirational. Plus, who doesn't need a touch of glamour when waiting for a service wash?